By LUDWIG VON KOOPA - But is he really free? It has been one year since George Zimmerman could rest from the most traumatic period of his life: Being put on trial for a murder of a teenager with the entire nation watching you. With the help of his Ace Attorneys, he managed to secure the just "Not Guilty" verdict. 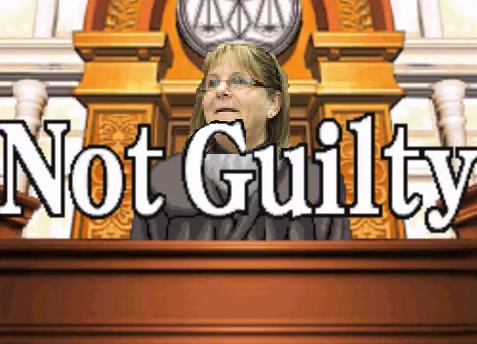 Although if it were up to Judge Debra Nelson, it would be a guilty verdict. Such a thing happens every day across the United States of America. So why are we singularly obsessed over this one trial? Well, as we've written many times before ("Zimmerman" has now been name-dropped in 32 KoopaTV articles, and has been the primary subject of... [one, two, three, four, five, six being what was linked in the opening paragraph] seven articles, including this one), not every person on trial in America has a huge media frenzy on them. Not every trial polarizes America, and not every trial has such a wild cast of amusing characters. Most trials are actually pretty boring. There are many more that may or may not be put into short little YouTube clips. There is a YouTube playlist that's 87 hours long of the whole trial in action. If you have nothing to do, you could watch it. It's not required watching, but still. However, unlike our beloved Ace Attorney franchise, which we've made many comparisons with, there is something starkly different about the fate of Zimmerman and the fate of Phoenix Wright's defendants. Losers gallery. Their job was to promote mis-information to try to ruin a man's life. If we're truly comparing Zimmerman to an Ace Attorney character (which we must because this is a videogame commentary blog), then he is more like Yanni Yogi from the first Phoenix Wright: Ace Attorney than anyone else. Yanni Yogi, like George Zimmerman, was innocent of murder. Yanni Yogi was a courtroom bailiff, sort of similar to how Zimmerman was a neighbourhood watch captain except not at all. Like Zimmerman, Yogi did not actually commit a crime. However, like Don West and Mark O'Mara, Robert Hammond, Yogi's defense attorney, basically soiled Yogi's name to get the "Not Guilty" verdict. He forced Yogi to plead that he was temporarily insane and had brain damage due to a lack of oxygen as a result of being trapped in the courthouse elevator for hours. 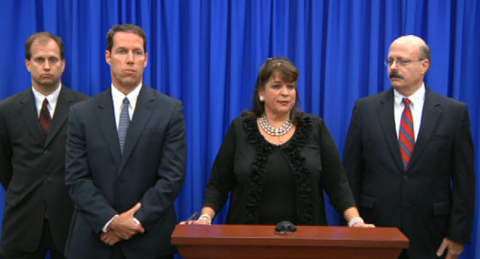 Meanwhile, the centerpiece of Mark O'Mara's defense was that George Zimmerman was an overweight, out-of-shape, and very weak shell of a man: Zimmerman had to shoot Trayvon Martin because Zimmerman could not throw a punch properly to save his life. Yanni Yogi lost his fiancée to suicide after his "Not Guilty" verdict. He lost his job, his friends, his fingerprints, and his house, moving to a boat rental shack. All he had left was a parrot. Post-verdict, Zimmerman has been divorced, he doesn't have a job and sort of never did, his friends hate him, he still has his fingerprints but his other prints — his paintings — are accused of being plagiarized, and he is homeless. All he has left is... the Twitter bird. 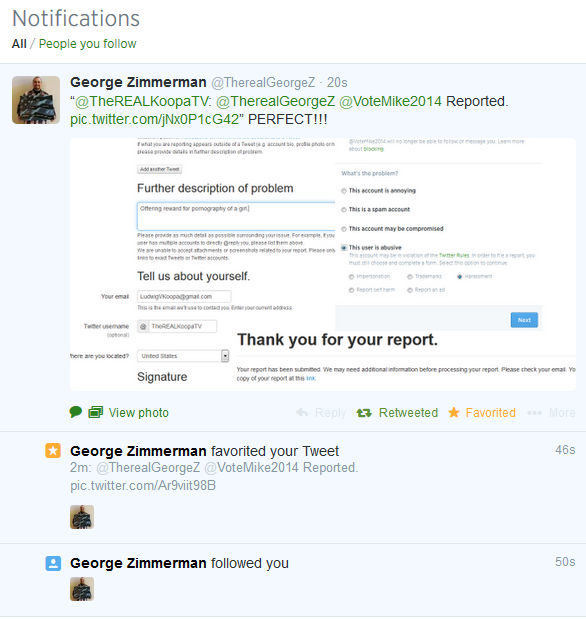 KoopaTV's Twitter account is followed by George Zimmerman! Maybe you should follow it too! Now, back to completely-related George Zimmerman discussion. Watching the stream of the trial was like a second E3 for us in 2013. Unfortunately, 2014 doesn't have anything like that for us to enjoy. Rawk once suggested that Zimmerman should kill someone every year to make it an annualized event, but that's... realistically preposterous. I don't agree with his extreme callous for human life, but on another note, it relies on juries not being sick of Zimmerman every time so he can be declared "Not Guilty" to come back next year. That's not a good thing to bet on, judging on how people say that OJ Simpson's 33-year sentence for armed robbery was "retribution" for him being "Not Guilty" of his wife's murder. You don't want Zimmerman near that kind of retribution. Especially since Zimmerman is actually not guilty of murder but OJ Simpson really did commit a murder. We all have our own personal Zimmerman: Someone we hate based off of emotions, not on facts. Like Florida medical examiner Shiping Bao always did, we must separate our opinions and our facts. And we should try to have those opinions based on those facts. If it's not 100% the verified truth, it's a working theory. And you should not damn someone's life just based on a theory. After all, to be guilty means you did it beyond a reasonable doubt! You can see even I might fall victim to this: During the Zimmerman trial, I compared Mark O'Mara to the virtuous Phoenix Wright, defending his client and believing in him even with everyone else against him. Zimmerman had no one else to turn to — even President Barack Hussein Obama was against him! But now, one year later, O'Mara is compared to Mr. Hammond. He's a jerk. Seriously, buy Phoenix Wright: Ace Attorney 123 when it comes out Holiday 2014 in the United States. What will George Zimmerman do next? Well, what can he do? Not much. Don't count him out yet, though. That Super Smash Bros. 4 appearance is going to wipe out his lawyer-debt! And you thought Sakurai was only giving Mega Man a chance at revival? No way, baby, GEORGE ZIMMERMAN GETS ANOTHER CHANCE! Ludwig thinks George Zimmerman is a hero. This might be the last Zimmerman-focused article for a while, so ZimmermanTV will now be going back to your regularly scheduled KoopaTV. George Zimmerman was later removed from Super Smash Bros. 4, thus wiping out his prospects of returning to normal life. Zimmerman's freedom is threatened as he gets arrested for throwing a wine bottle. Zimmerman is free in better ways, like no Eric Holder after him. Yanni Yogi's/Robert Hammond's incident happened in real-time at the end of 2016, and KoopaTV covered it. I disagree with widespread media coverage of trials. Being accused of a crime will change the way some people you know look at you, regardless of what the jury decides--when thousands of people you don't know are coming to their own personal conclusions about whether or not you're guilty, that's dangerous. There might be something on that from a social psychology perspective, too, but I couldn't find it. And.... I... can't resist... *shouts* To see the events leading up to Yanni Yogi's disastrous trial, convince Capcom to localize Ace Attorney Investigations 2! Widespread media coverage of trials does bring disaster to the defendant, yes. But in this instance it provided entertainment for the masses. ...Which is a pretty bad trade-off when the masses SHOULD be getting entertained by reading Simon Blackquill fan-fics. But we like transparency, and knowing the justice system works is important! I never watch any of the publicized trials. ...My great-grandmother turns both of her TVs on so she won't miss anything even if she has to go into the other room. Your great-grandmother sounds... great. Pun intended.